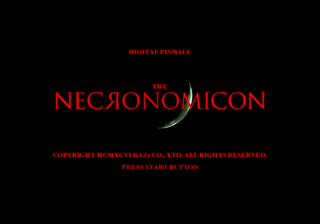 Digital Pinball: Necronomicon (デジタルピンボール ネクロノミコン) is a pinball game developed by KAZe for the Sega Saturn in 1996. It is a sequel to Digital Pinball: Last Gladiators, and was only released in Japan; as with many KAZe games, all the text and vocals are in English anyway. Main article: Digital Pinball: Necronomicon/Magazine articles.